The hummingbirds are gorgeous in my backyard now. We only get ruby throated hummingbirds here with an occasional visit during early or late summer from a more exotic variety. But wow! They are beautiful little jewels. So I had to do this quick watercolor painting tutorial of a hummingbird! Our ruby throated hummingbirds are more skittish than the hummingbirds in Thuya Gardens, Northeast Harbor, Maine. In September at Thuya, they are little ping pong balls drinking nectar or sitting sleeping on waving flower stems, completely sated. I have the best hummingbird photos of my life from Thuya Gardens, so those are the photos I use. 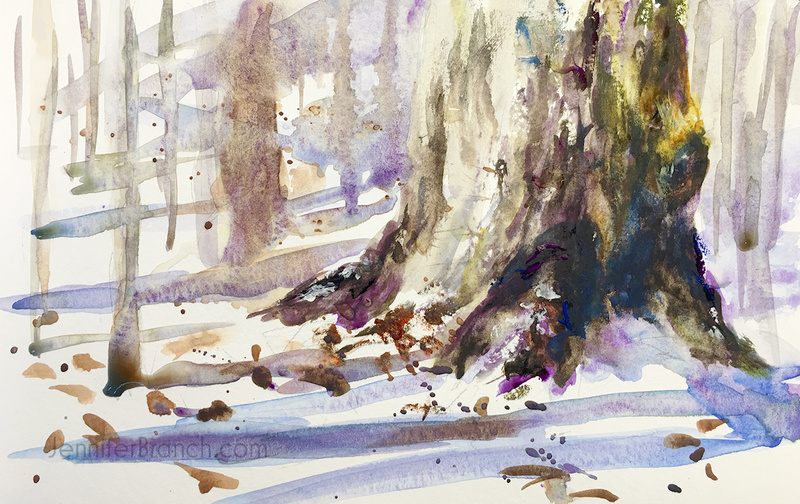 Rapidly moving objects � I take photos to paint from! Always sketch very lightly for a watercolor painting. You don�t want graphite muddying your pretty colors. All you need is a loose sketch. Don�t draw every feather. I use a regular 2B pencil. I started with an Azo Yellow and Pthalo Green wash. A few dabs of Quinacridone Gold. Let the colors loosely float in, keeping everything wet and flowing. Don�t forget to reserve whites! Notice I always pull color into shadows on my subject from the start. This connects my subject with the background. While everything is still soaking wet, I add color. Some strong darks in Burnt Sienna and Ultramarine Blue. Some Ultramarine Pink for the lovely verbena bonariensis. I keep moving these colors into my hummingbird. Watercolors need to flow, not be cutouts! Some Quinacridone Gold makes for lovely sparks under the feathers on my hummingbird. 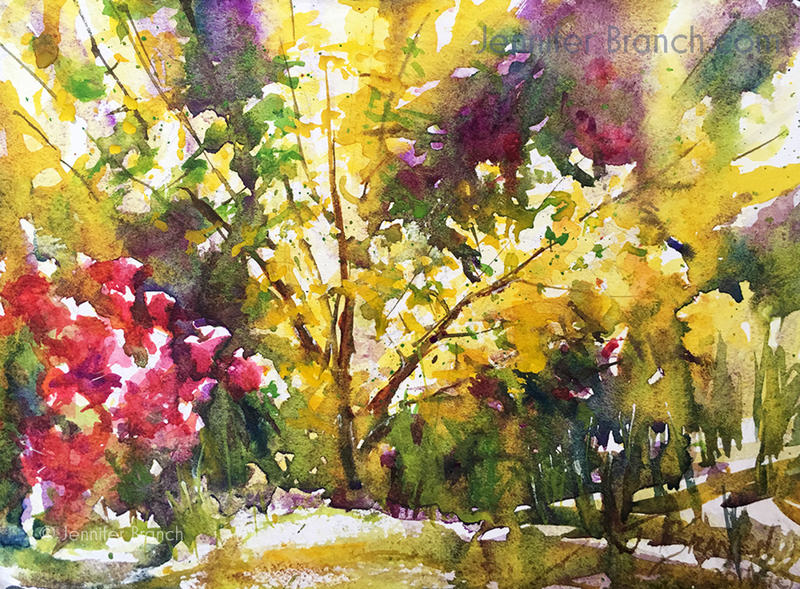 I add a little detail to the verbena bonariensis with Ultramarine Pink and Cobalt Teal. I add some strong Ultramarine Blue and Burnt Sienna darks. I move all the colors around the painting. Around here is when my toddler woke up from his nap. The same symphony of colors repeated around the painting. Lots of darks, but leaving whites. Always leave whites! I left the painting under a fan for 5 minutes while I hosed the toddler down and changed my water. Just long enough to dry a little bit so I could add details to the hummingbird. I always get a little fussy with hummingbird details. They�re little jewels of birds, the colors iridescent in the sun. So many, many layers with drybrush as well as the underwash of golds and yellows. Notice how much lighter the colors are when even partially dried. What looked a bit dark and almost muddy on the previous wash when wet, dried out to a nice dark green with interesting dabs of other colors. Always put your paints on boldly, they will lighten up! Thanks for seeing this watercolor painting tutorial of a hummingbird! 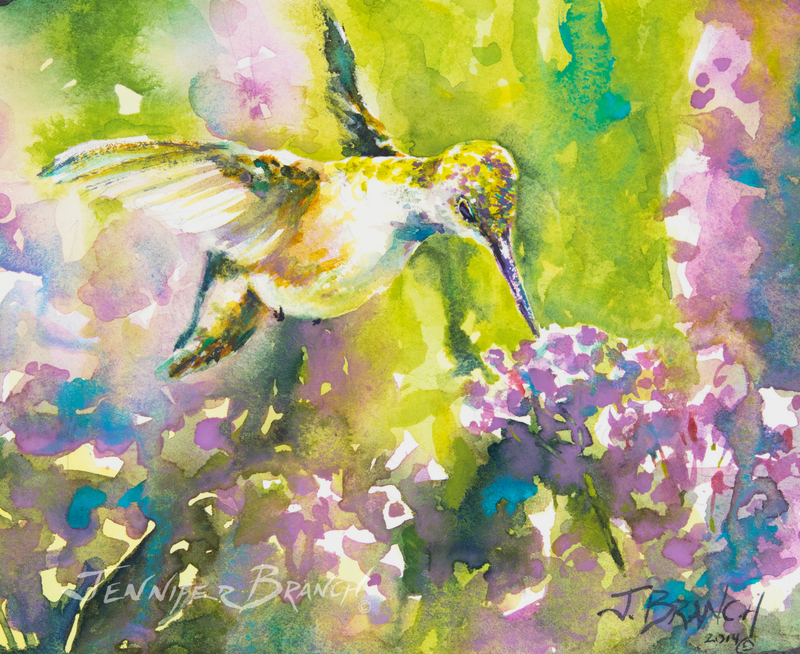 To purchase Hummingbird on Verbena original watercolor painting, please click! 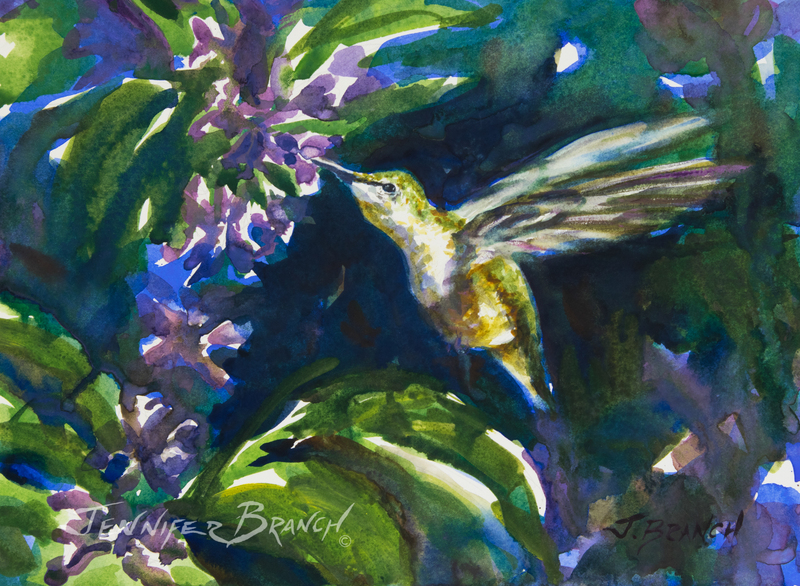 Hummingbird on Verbena Final Watercolor Painting!